I live in a city, and the back door of our condo has a regular wood and glass door that swings inward and a iron security door that swings outward. The security door currently has a deadbolt which un/locks with a key on both the inside and outside. We would like to replace the outer door, including switching to a deadbolt with a thumb-turn latch that doesn't require a key to unlock from the inside. This is required by law if we ever decide we want to rent out our place. The security concern would then be that someone could just cut the mesh and reach in to easily unlock the security door. To combat this, I've often seen security doors with a metal cylinder around the latch so that you cannot reach it and unlock it while the inner door is closed. My question is, what is this guard around the latch called? I've tried searching and can't find any pictures of this type of latch guard. Not knowing what this is called then makes it impossible to find a door that has one. Is this something that I can even purchase COTS, or will I need a welder to make one custom for the door? It's called a "Thumb Turn Cover", "Door Latch Guard", or "Cylinder Guard" and installs under your thumb turn mount plate, so it should be a DIY job. 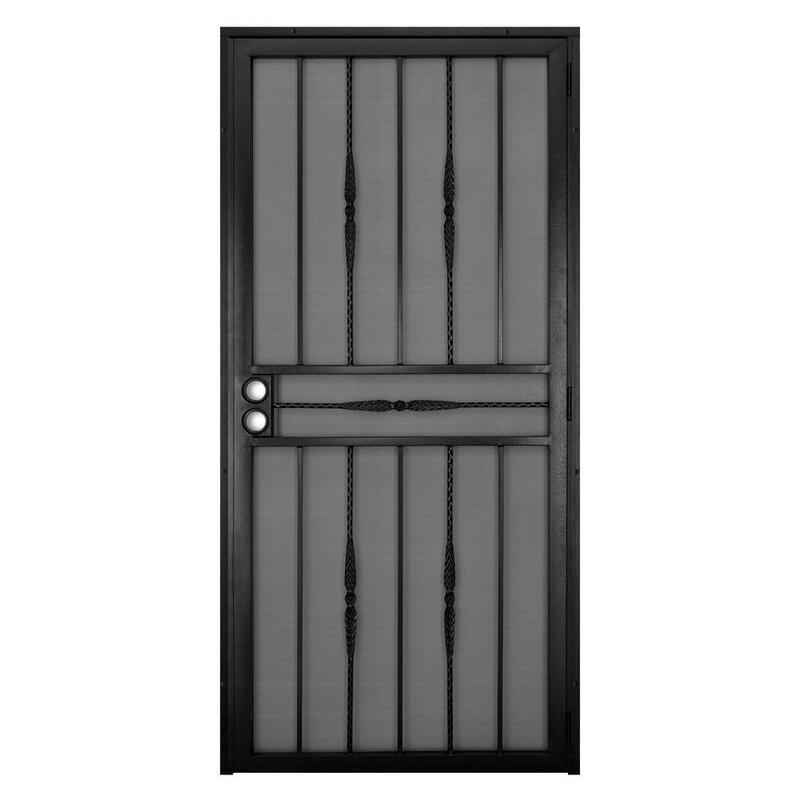 It took me a very long time to pick out my security door for this reason, it's very hard to find one that blocks potential reach-around disarms for less than $600. The most secure ones I saw all ensured that the openings within an arm length of the latch were all too small for someone to just stick an arm in. Similarly, the only built in cylinder guards I saw weren't really deep enough to prevent a reach around. For me, the point of the security guard was so that my girlfriend could open the front door to talk to someone if needed, but not worry about them trying getting into the house. As adding a cylinder guards would won't protect against this for a quick moving intruder you may want to consider a "Screen Door Grill" or "Screen Door Pet Gill" installed on the interior side at lock height instead. They mount with screws, so you could DIY it. One standard way to do this is to weld a pipe around the lock cylinder/deadbolt latch. The pipe extends as close to the inner door as is practical. Another standard way to do it to weld a flat plate on the outside of the security door such that one can't reach around and open it easily. The closest thing I have seen is a flip guard cover. But the space between the doors may need to be less than 1 inch. Basicly a hinged slot folds over the thumb latch so it cannot be turned, open the inside door and then you can flip the cover up and turn the latch. Not quite what you are looking for but may work. Not the answer you're looking for? Browse other questions tagged doors security deadbolt or ask your own question. How can I secure a door with a window right next to it? Multi point door lock security and can I use wood screws near it? Is half a Euro cylinder lock practical in a patio door? Is it possible to replace Mortise Door Lock With Sash Lock with a thumbturn deadbolt? Should I replace a knob lock when replacing a matching deadbolt?